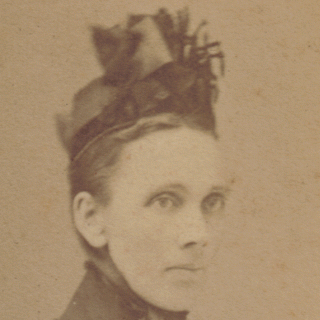 Ellen Forster was born on 17 December 1849 in Wincham, Cheshire. In 1851 the family was living in Pickmere Lane, Wincham; and in 1861 they were living in nearby Pickmere. On 9 February 1865, she married John Hankey, a labourer from Pickmere, in the Parish Church in the parish of Great Budworth. They had nine children, however five died in childhood. Tragically, the first three all died within a month of each other in 1870. The fifth child James Hankey was born on 9 March 1873. The family lived in Brook Cottage, Pickmere. John died on 7 October 1915 and was buried at St Mary's and all Saints Church in Great Budworth on 12 October 1915. Ellen died on 19 July 1934 and was burried with John, and five of their children, on 24 July 1934. 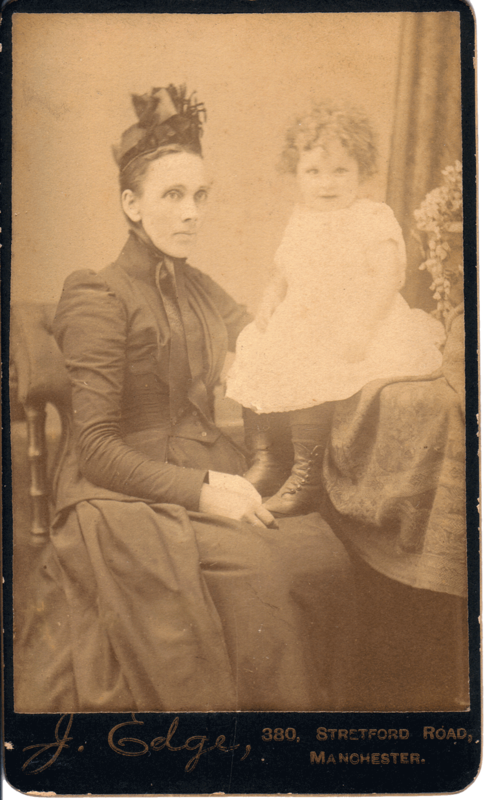 Ellen Hankey nee Forster with her youngest daughter Gertrude Ellen Hankey. 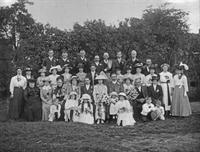 Wedding photograph for the marriage of Harold Hayman to Gertrude (Gertie) Hankey on 8 July 1914. Ellen Hankey is seated front row, third from left. Also in the picture is her husband John Hankey - seated front row, second from right; their son James Hankey, standing in the back row extreme right. 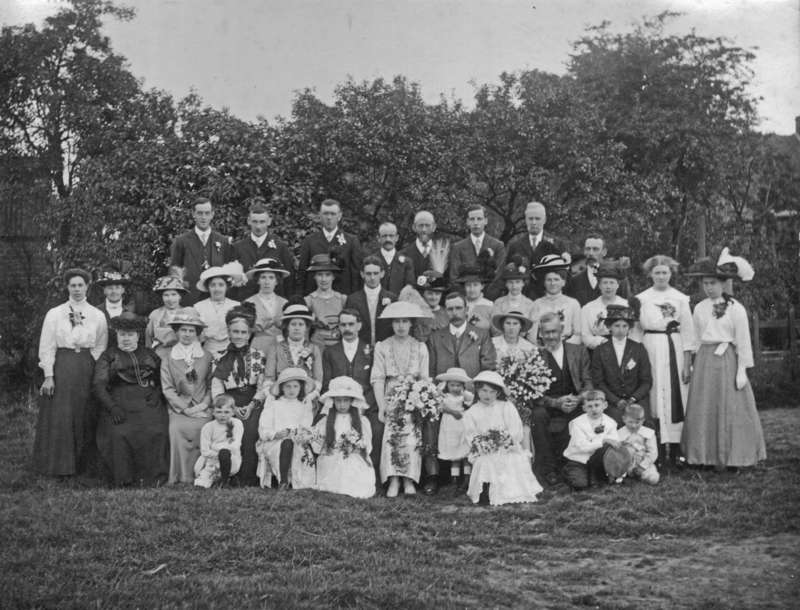 James's wife Ada Hankey - extreme right; James's daughter Emily - third child from left; and it is assumed that his daughter Mabel is the youngest girl standing in front of who is presumed to be the groom's father; Gertie's sister Annie Stephenson is standing sixth from left in the middle row, and Annie's son Reginald Stephenson is the child on the extreme left. 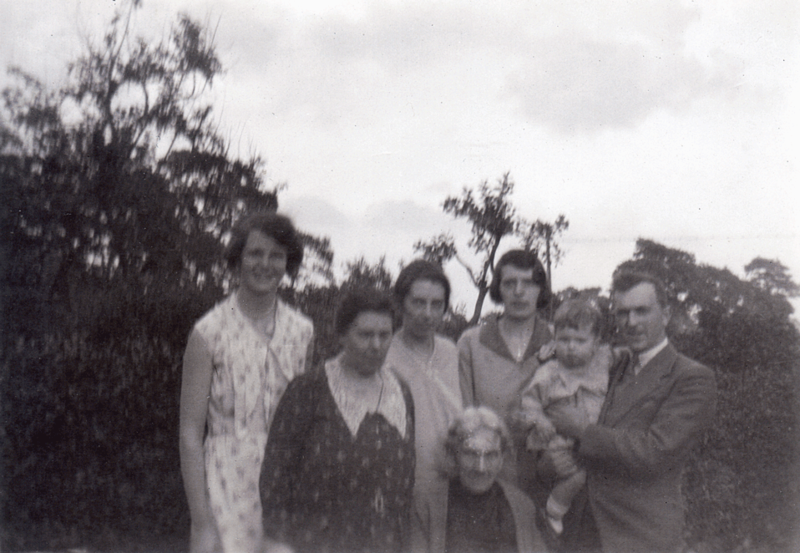 The rest of the people in the photograph have yet to be identified. 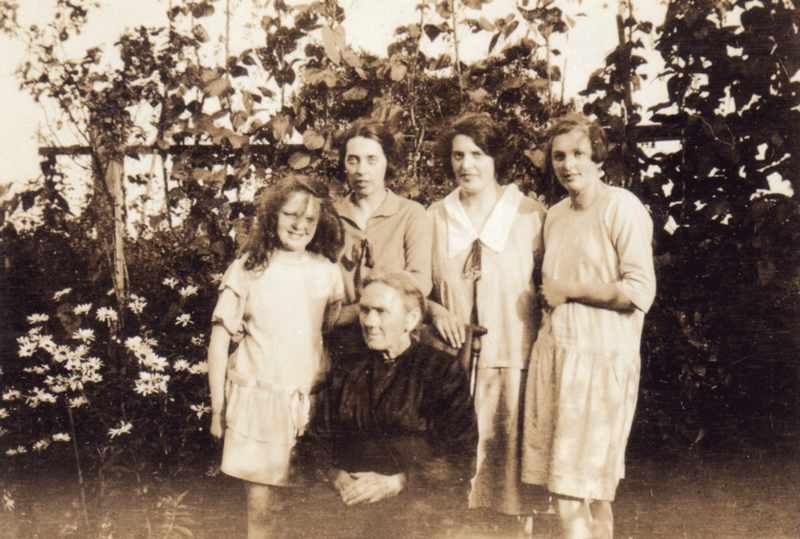 Ellen Hankey with four of her Granddaughters: Gweneth Hayman, Emily Hankey, Mabel Hankey and Alice Mildred Hankey. 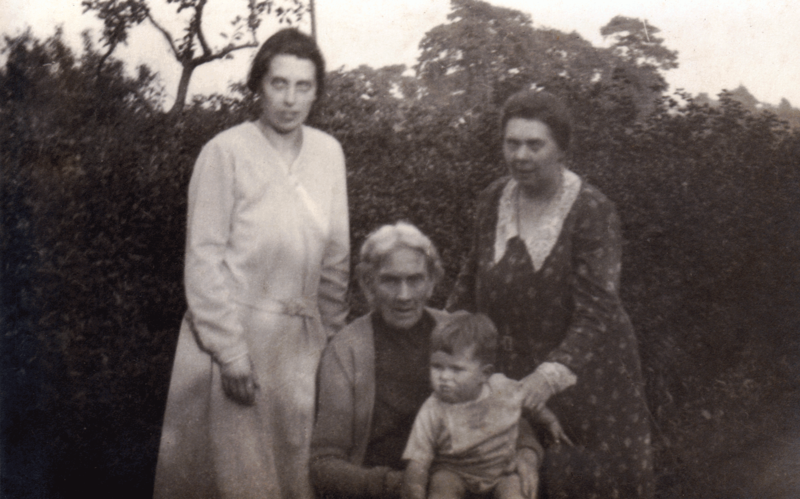 Ellen Hankey with her daughter-in-law Ada Hankey, granddaughter Emily Green and great grandson. The Hankey Family in 1932. 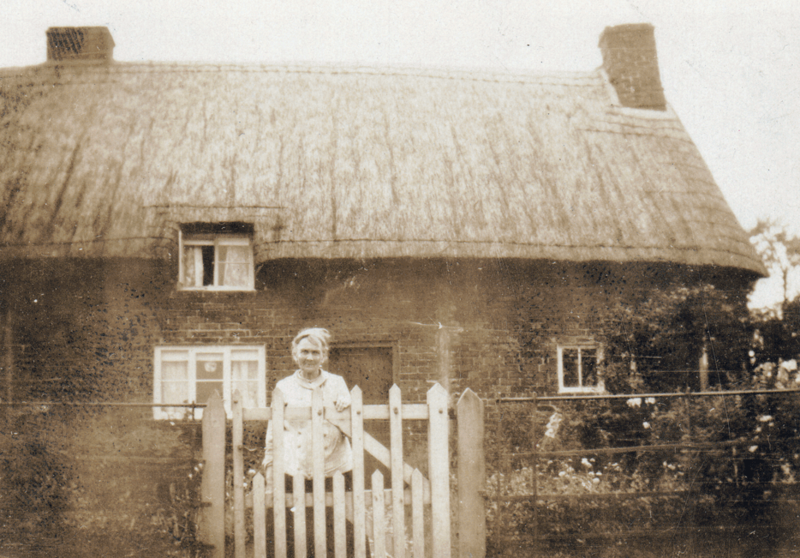 Ellen Hankey outside Brook Cottage, Pickmere, where she lived. In loving memory of our dear mother, Ellen Hankey, Widow of the late John Hankey, of Pickmere, Who departed this life July 19th, 1934, Aged 84 Years; And was interred at Gt. Budworth Church July 24th.